"The Most Effective Method to Learn Calculus The Intuitive Way"
I'm glad you arrived to this page, since this means there's a good chance you'll succeed in calculus (if you continue reading). If you want to feel at ease during calculus tests, gain confidence in your mathematical capacity and just get an excellent grade in calculus, then you've found the way. My name is Pablo Antuna, I've been a calculus tutor for some years now and I'm on my way to my math PhD. Mathematics is my passion. I never considered myself a good writer, but I wanted to share something with you. You see, as I started tutoring math students, I realized something that was disturbing to me: Calculus is usually the stumbling block for students of the sciences and engineering. That is, many students give up a carreer in science or the dream to be an engineer because they don't consider themselves smart enough to master calculus. As I advanced in my mathematics carreer, I cleared a misconception that most people have about math: to be good at math you need an inborn talent. There are indeed some really gifted people out there. However, the truth is that most mathematicians and most people that use advanced math are normal people, just like you and me. What they have of special is the way they think. And that way of thinking can be taught, and learned. I like to call this way of thinking intuitive thinking. What I mean by this is forming an intuitive idea in your mind of the concepts you learn. This intuitive idea can be composed of pictures or other abstract ideas, but it must be something meaningful to you. Almost every math teacher uses this method of thinking. However, they don't give enough examples of how to do it for their students to learn it. They not only started getting better grades, almost all of them also told me they started liking math much more than before. You see, most people think math is about boring formulas and tedious calculations. These things are a part of math, but they are the grammar of math, not the poetry. The poetry of math is formed by the intuitive ideas. But enought about poetry, how can I help YOU succeed at calculus? I decided to create the ultimate resource for learning calculus the intuitive way, it is called The Intuitive Calculus Course. This module is an ebook in Adobe PDF format that you can immediately download to your computer. This module deals with the first topic of calculus: Limits. With it you'll learn the basics of calculus the intuitive way. It will give you a really strong foundation for the rest of calculus. This is really the place to start... It would be a good idea to get the second module too so you can continue just as you finish this first module (best deal? Get both now!). You'll not only learn the intuitive ideas, but also learn to solve problems that usually appear on exams using simple techniques (I specially selected them from real-life tests of different top universities). As a supplement to your lectures and textbook. If you are taking a calculus course this modules is excelent as a supplement to the materials your teacher gives you. I'm sure you know that failure rate at calculus is usually higher than 50%. So, why take chances? Learn calculus the intuitive way and you'll surprise your teacher and classmates with your new skills! For self-study. This module is really suited for self-study, because the intuitive idea behind the concepts are stressed and carefully explained. The examples are solved step-by-step so you can learn all the problem-solving techniques without headaches. If you plan on taking a calculus course in the future, it is a terrific idea to start early with this course! So, what will you learn from it? A deep intuitive understanding of limits. In my experience, this is achieved by very few students. This understanding sets appart notable students from average ones. In this module you'll develop this intuitive understanding with a method that never failed to this day (even with those students that considered themselves dumb at math). Complete mastery of problem-solving techniques for limits. After you developed a basic intuition of limits, we'll begin to solve problems that usually appear on calculus courses and tests (these problems will also help to strengthen your intuition). We may use techniques that are different from the ones you'd find on your textbook (you may even give your teacher a great surprise with your more efficient method of problem-solving). Learn all formulas without excessive and boring memorization. I'll show you how to learn all the formulas you'll need without dumb and boring memorization. With this method of learning I'm sure you'll start liking math much more than before (I think this is one of the greatest benefits of The Intuitive Calculus Course). Learn the intuitive idea behind all formulas. This is one of the highlights of the course. You won't learn all formulas by rote memorization as most students do. You will know the intuitive reason behind all formulas and equations you use (you may even learn to prove formulas in your head!). I'm sure your classmates and teachers will be surprised with your new skills (this ability is a mark of what people generally call "genius"). A complete review and practice final exam. It is essential to practice taking exams. Your first calculus course isn't like anything you had before, so, it is very important to have an idea of what to expect in a final exam. In the final chapter you'll find a complete review of all concepts and a real final exam for you to practice (problems taken from a variety of top universities). I'm sure you'll find it challenging, have fun with it! Some people tell me there are already many calculus textbooks out there. That's true, but there's nothing like The Intuitive Calculus Course. That's because this is not a textbook. You see, most textbooks are written with teachers in mind. How so? Aren't they used by students? Yes. However, the truth is that teachers are the ones who assign to their students which textbook to use. So, if teachers don't like a particular textbook, no one will buy it. Not many authors are willing to write a book that nobody will read. So, the result is that authors try to please teachers with their books. This means that they try to be very correct and formal in their writing. They try very hard to avoid any logical error and many times disregard the need to convey the intuitive idea of concepts, or even to explain with detail how to solve a particular problem. This is not the case with The Intuitive Calculus Course, because this is a course with you, the student, in mind. You know that your first calculus course can be the turning point of your carreer. Why not make your success inevitable? Let's compare The Intuitive Calculus Course with other ways in which you can really learn calculus. One way is to try to learn only from your lectures and reading your book. This is the traditional method. However, as I pointed earlier, this method is not the most effective. Another option is to hire a tutor. This may seem a viable solution, but do you know how much that costs? A good tutor may cost between 40$ and 80$ per hour. Just check this site for yourself. That's much more that triple of the cost of the first module of the Intuitive Calculus Course. To make this first module accesible to the most people possible, I priced only $12.75. For this price a tutor would teach you only about 10 minutes. Why such a low price for a 60-page ebook with the most effective method to learn the first part of calculus? Since you’ll be downloading the ebook directly from the Internet, I have no inventory and no fulfillment costs. That way I can pass the savings to you. Never bought an eBook online before? Click here! Buy with confidence from Clickbank, the authorized retailer of The Intuitive Calculus Course, where your transaction will be handled by a secure server. Clickbank currently sells more than 10,000 digital products online, and the number is growing daily. I’m going to give you a 100% RISK-FREE, 90-day money back GUARANTEE. If you happen to ask for a refund, it is Clickbank’s policy to send money back immediately. Give this module a good try and you'll see the results quickly. If after 90 days you feel that you haven't improved, then contact me and you will receive a full refund. 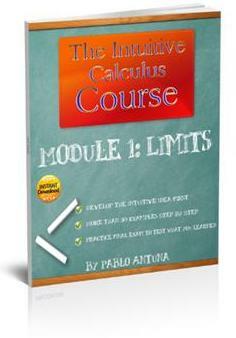 You’ll get first module of The Intuitive Calculus Course, which you can immediately download. And you’ll complete your transaction with the trusted and secure Clickbank company. You can start acing those calculus tests and even enjoying learning calculus, just 5 minutes from now. P.S. Remember, unless you do something proactive about your situation in calculus you won't improve. You can have the ebook in the next 5 minutes and ace your very next test by applying the techniques and methods in it.